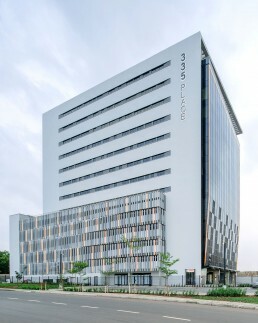 335 Place is an A grade multi-tenant office tower in Accra, Ghana. Located in the oil, gas and mining corridor, 355 Place is in close proximity to Kotoka International Airport, star-rated hotels and Accra Mall. 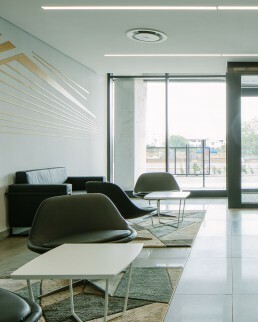 With its strategic location, 355 Place provides an exclusive work environment that caters to the many needs of its tenants, enabling a better work-life balance. The ground floor opens the door to retail and restaurant tenants, including a Forex Exchange, cafe and other facilities, while shaded outdoor balconies offer breakaway spaces. The top floor plays host to an upmarket sky bar restaurant with captivating balcony views. Four above-ground parking levels, wrap around the building offering easy access from the ground floor up. Above this sits a podium with eight office floors rising up to create an impressive 12-storey building. All office floors are optimally formed around a central core with space optimised to offer the option of one to four tenants per floor. The architecture draws inspiration from the multitude of fabrics, patterns and textures associated with Ghanaian culture and traditions. Playing with varying shades of grey, light-weight concrete panels along the secondary and wider façade of the parking podium emulate traditional rectangular patterning. 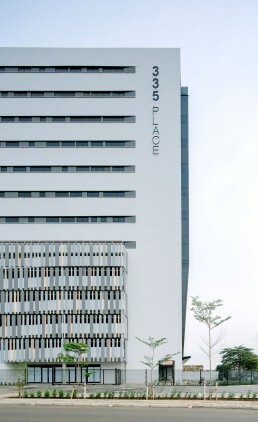 Aluminium louvres and the sleek glass façade are offset against the textured panels. The contrast of elements between the different elevations emphasises the vertical height of the face of the building. The design seeks to effectively reduce solar heat gain by optimized shading. 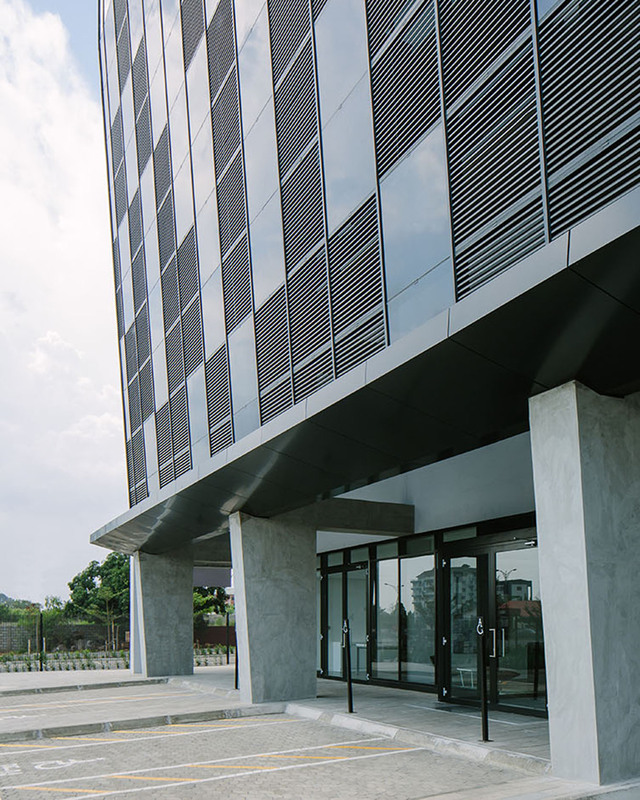 Situated to the west of the Legion Road and Accra Tema Highway interchange, the building’s narrower, primary façade interfaces with the main highway while the secondary facades respond appropriately to the building’s orientation, scale and context of Albaran Road and Atlantic Street. The angular building face is setback from Accra Tema Highway, respecting the town planning guidelines, and accentuating the stature of the building. To address the constant congested traffic in Accra, 355 Place has multiple entry and exit points, providing easy access all round. Easily recognisable from Accra Tema Highway, 355 Place is a noteable landmark in Accra.